So this is what it feels like when doves make real estate investments. 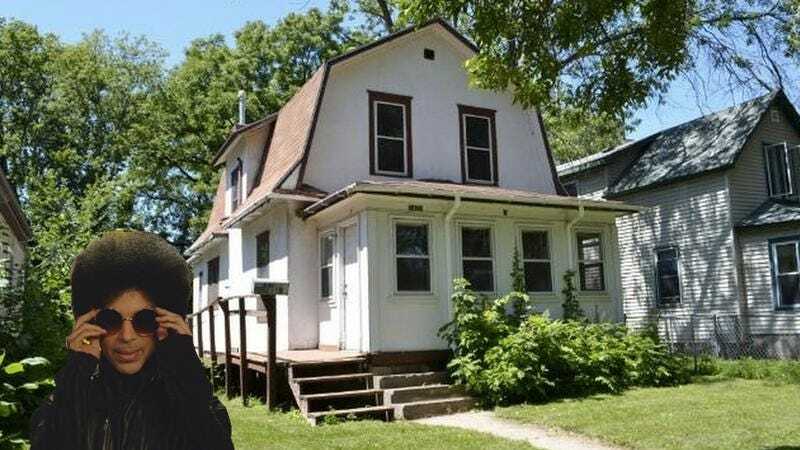 Minnesota’s public radio station The Current reports the house used as the residence of “The Kid” in the film Purple Rain is for sale. That’s right: The four walls and a roof that appeared in a movie 31 years ago, and is 100 percent a place Prince would not be caught dead living in, is on the market. For the eminently reasonable price of $110,000, it can be yours, so that you, too, can experience the vicarious thrill of looking around and going, “Eh, maybe for a movie I’d live here, like Prince.” By then it will be too late, and you’ll own the place, but still, that will be quite a moment. You can take a closer look at the property in the online listing, and it’s a fairly appealing little place: 3 bedrooms, 1.5 baths, more than 1,300 square feet, but sadly, no indication of which rooms Prince may or may not have briefly stood around in back in 1984, eyes smoldering, while the key grip adjusted something. Also, the listing is pretty direct about the state of the building. “This home needs to be rehabbed,” it flatly says, likely because the place is so burnt out from crazy partying and whatever addictions it may have picked up through the years. Yeah, addicted to funky rock and roll, sure, but who knows what else? Maybe it‘s actually a money pit, and then you can get the full feeling-like-Prince experience: a years-long lawsuit as you struggle to free yourself of the prison to which you’re legally beholden.